Each piece of paper is specially printed to look like a hamburger, fish sandwich, fries, or soda. It takes several sheets – carefully cut and folded – to craft each into an intricate masterpiece. Yum! Here’s a replica of your everyday Japanese lunch box. Clockwise from bottom left is: a rolled omelette, rice balls, a tube of sauce, potato salad and a tomato. 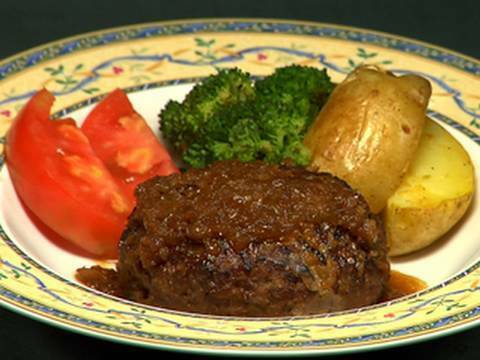 The brown thing is a German import called a “hamburg steak,” or as Japanese pronounce, “ham-bah-gu.” which is basically a hamburger without the bun. We all know just how decadent a Japanese meal can be. Think $200 plates of raw fugu, and kaiseki ryouri packed with seasonal vegetables and well-marbled meat. But what’s on the other end of the spectrum? It’s called “Okashina Furikake,” which is a double-entendre meaning “snack-like condiment” and “rice-topping oddity.” It’s a simple device: Just pour in your snack of choice, then push and turn the handle. You can use just about anything: potato chips, pretzels, even cookies. Speaking of furikake, I did some sleuthing and found it was invented in the early 1900s by a pharmacist who wanted to add more calcium into people’s diet. So he started crushing fish bones and mixed it with sesame seeds and dried seaweed to cover the fishy flavor. The bones have since been replaced by dried egg, vegetables, bonito flakes, and dozens of other yummy ingredients but my people’s love for rice topping has gone unwavered. You might not be able to fix your broken radiator, but it still comes in handy whenever your inner cocoa demon attacks. Kobe Frantz produces them as part of their “Car Mania Set V4,” which includes monkey wrenches, nuts and bolts, pliers, a screwdriver and car keys, each made with high-quality couverture chocolate. A dream gift for the sweet-tooth car enthusiast, don’t you think? It’s a tiny 3-megapixel toy perfect for keeping in your clutch for a night on the town. Amazingly, it also takes video and connects to your computer with a USB cable. It makes for a good spy camera, too; As you’re snapping shots, everyone will think you’re nibbling on an after-dinner mint! So what’s your favorite piece of chocolate?? either rice and furikake or a steamy bowl of ochazuke. Starch was her addiction. Place this cutie bear of a pot into the microwave and he’ll cook rice for you in under 10 minutes — four times faster than the conventional cooker. The cooking process is easy: Just pour in water and fill the raw grains up to the line marked on the container, then microwave. As an added bonus, you get a shamoji (rice paddle) and an extra compartment for steaming vegetables.